Fiat Chrysler topped No. 2 Ford by 278 retail deliveries in June, helped in part by the Jeep brand's popularity. 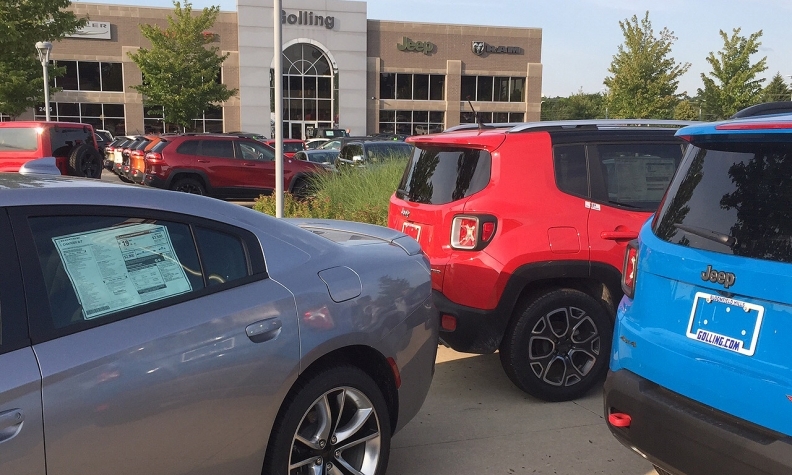 DETROIT (Bloomberg) -- Fiat Chrysler Automobiles' retail sales in the U.S. topped Ford Motor Co.’s in June, the first month that’s happened, CNBC and Bloomberg reported today. Fiat Chrysler, which ranks fourth in the U.S. market in total sales, topped No. 2 Ford by 278 retail deliveries, two people familiar with the matter told Bloomberg. The people asked not to be identified because the companies don’t typically reveal detailed retail results. Ford and Fiat Chrysler declined to disclose their retail sales. Retail sales exclude discounted sales to bulk buyers such as governments and rental-car companies. They are often more profitable than fleet transactions, and they are also seen as an important reflection of consumer demand and an indicator of future used-vehicle values. Before last month, the former Chrysler Group had outsold Ford in retail sales only twice in recent memory -- February 2009, when Chrysler Group dealers rallied to keep the company afloat, and November 2006, when Ford CEO Alan Mulally moved to borrow $23.6 billion to support the financially strapped company. About 23 percent of Fiat Chrysler’s sales in the U.S. and Canada in the first quarter of 2015 were to fleets. Ford said in a conference call today that fleet sales were 35 percent of its U.S. total. Based on that figure, Ford sold about 146,670 vehicles at retail last month. Fiat Chrysler’s total U.S. sales rose 8.2 percent in June to 185,035 as its Jeep SUVs and Ram trucks won buyers, maintaining a streak of monthly sales gains that spans more than five years. Ford’s light-vehicle sales rose 1.5 percent. F-series pickup sales slid 8.9 percent as the automaker said it continues to build inventory of the new aluminum-bodied F-150. General Motors said its Chevrolet brand beat Ford’s namesake brand at retail in the month. GM said it cut its sales to rental-car companies by 45 percent in June as it ended deliveries of the Chevrolet Captiva, which had been sold only for rental use. Consumers are snapping up light trucks amid relatively low gasoline prices and interest rates, a trend that benefits Fiat Chrysler, which gets about three-quarters of its sales from pickups, SUVs and vans.